The BIG news this week is that the NHL has officially digitized a lot of its records. Now, more of the stats on NHL.com go further back in time. For instance, I just worked on something related to penalty shots, and saw that the data went back to the 1934-35 season. So, this is obviously a great day for hockey stat lovers. Another piece of news is that Corsica Hockey will be joining the Nations Network. Just when you thought everybody was going to work with the Athletic, the Nations Network lands another top resource. 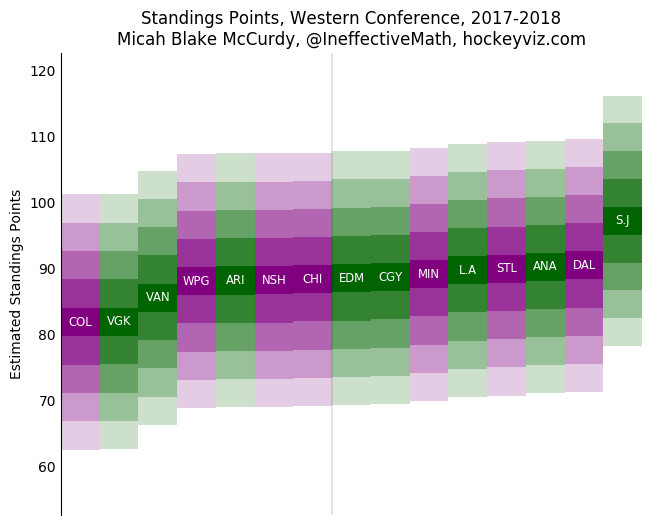 Now, let's get on with today's post, which includes a look at the best LW/RW, players on PTO, and for which teams stats and conventional wisdom have the most wildly different expectations. First, we tackled the right wing. Kane was most popular choice, but it was relatively close. I can't say that I disagree, given his incredible scoring totals over the years, but I wouldn't object to Kucherov or Tarasenko, either. The choice of left wing was a little more clear, Jamie Benn of the Dallas Stars. Unlike all of these wingers (except Brad Marchand), Benn is used as more of a two-way player, and yet he can still score. Still, I'm surprised that the support was so resounding - I figure Ovechkin would be the most popular choice. The rest of his team is relatively obvious. What do you think, can Mr. Burns beat Shelbyville with Benn-(Crosby or McDavid)-Kane up front? One of the other big discussion points of the week were players on PTOs, so I put together a player usage chart of those who were still active on September 25. As you can see there's no one who is likely to really move the needle. In my view, Parenteau and Purcell make nice additions to the bottom six, and Franson is a great third-pairing defenseman, but they are all secondary players, at best. How does this compare to conventional wisdom? To answer that, we can compare this to the subjective results of a survey that Dom Luszczyszyn published not long ago. The biggest differences? In absolute terms, it's Edmonton, Tampa Bay, and Detroit. The former two are more beloved subjectively, and the latter by the model. To a lesser extent, the same could be written about Nashville and Anaheim subjectively, and about Colorado, Vegas, and Vancouver statistically. However, some of those differences are because a statistical model smashes the teams closer together, making the good teams look more average, and making the bad teams look a bit better. Detroit, who is commonly believed to finish last in the Atlantic, is statistically projected to finish 4th. Likewise, Dallas and St. Louis are expected to finish 1-and-2 in the Central by the model, but 4-and-5 by subjective opinion. Obviously, we get attached to the subjective opinions, because they are flooded with recency bias. 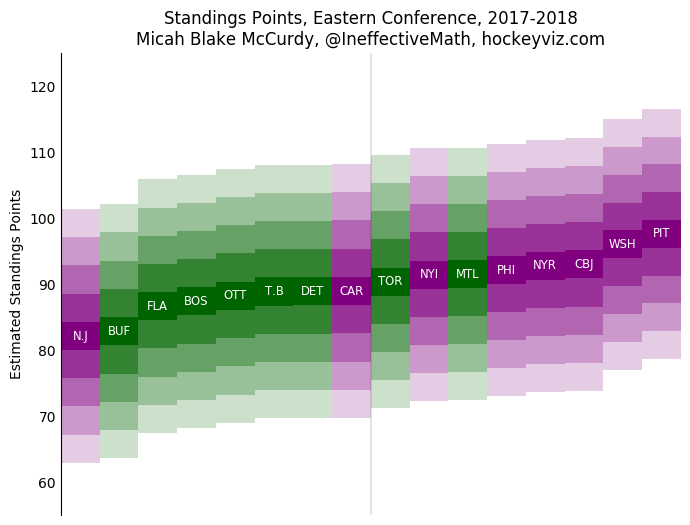 We believe that last year's standings were exactly what they should have been, even if we re-ran the season many times. In reality, luck had a huge impact on the standings, and therefore on our subjective opinions of each team. That's why there are ALWAYS massive changes in the standings relative to subjective expectations. Indeed, at least one of the four division winners usually misses the playoffs the next year - will that be Washington, Montreal, Chicago, or Anaheim? Plus, based on subjective opinion, did anyone expect Toronto (30th overall in 2015-16) or Columbus (27th) to do so well in 2016-17? Keep your mind open. Maybe Detroit is an ok team, and maybe Tampa Bay, Edmonton, and Nashville aren't nearly as good as we think. Or, maybe the results of the model are wrong. At the very least, it's interesting information.